With the ALP seriously on the nose pretty much throughout Australia, there has been an interesting trend with some of Labor’s high profile MPs not readily identifying themselves as being members of the Labor Party. But I suppose who can blame them after Julia Gillard has helped them to trash the Labor brand so convincingly over the past few years? Gillard’s and indeed Labor’s unique blend of politics has undeniably focussed on class and gender war, racism and xenophobia, and dodgy deals that kowtow to the Prime Minister’s supporters in some of Australia’s most militant unions. The Australian has an interesting article this morning outlining a who’s who of Labor politics who are a bit scared to admit that they are in the red corner. Because the article is behind Evil Rupert’s Evil Paywall, I will summarise the list for you all, as well as list some others that The Australian didn’t find. Mr Bowen doesnt even use the traditional colours of Labor, red and blue, instead choosing a lovely shade of orange. In his header there is no mention that he is a member of the Australian Labor Party. Kevni doesnt mention the dreaded Labor Party name anywhere on his site, but who could blame him? Mr Kelly does have the guts to place the word “Labor” in his header but there is no logo present on his page at all. As Mr Kelly obviously doesnt like the ALP logo, he might want to have a word to one of his Facebook followers who has insensitively used the dreaded moniker as their profile picture. It’s the only time you see the logo anywhere on his site. But he does have a series of lovely images rotating on his flash banner. Just don’t ask him what party he’s from. Well, there you have it folks. That looks like plenty to me and there may well be more but looking at their sites and seeing their rather blatant attempts to disassociate themselves from the toxicity that is the ALP brand is making my breakfast of Vegemite toast begin to climb back up my gullet. What can we say about these senior members of the Gillard government who just dont want their constituents to know that they are in fact part of the most dysfunctional caucus that Labor has ever produced? I’m sure you all have a few words that readily spring to mind. 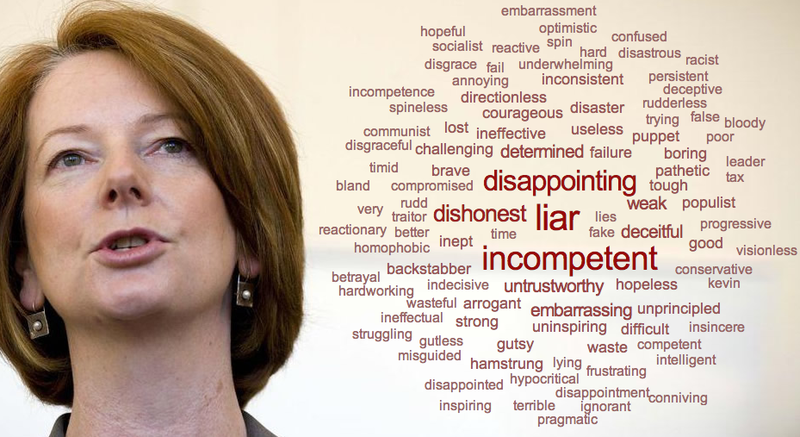 If not, here is the word cloud that ABC readers and listeners provided after Julia Gillard’s first year in office. I don’t think that there are many on there that are no longer applicable, but I will let you be the judge of that. The Orange colour scheme was used by some Labor candidates during the ACT elections last October. Had me puzzled then – it seemed a personal choice thing. I thought if you signed on to stand for Labor – then you had to accept their livery. Orange is often associated with a range of emotions such as passion, energy, happiness, enthusiasm, fascination, creativity, determination, attraction, succes and stimulation, but those things dont sound like New Labor to me. Perhaps these Labor figures are trying to project a subliminal message that they are independent from Labor? Thanks Tim, i will amend those errors. I always find myself putting too many commas into paragraphs and putting the odd apostrophe where it shouldn’t be. My English teacher is probably rolling over in her grave! Thanks for stopping by and letting me know, it is appreciated. I do the same, but have finally figured out how to fix it; at least for me. What you do is you write it and leave it for a few hours, and then come back to it with a big comma eraser and get rid of as many of them as you can possibly stand. If you knock out about half of them you’re on the right track. Tim my goodness……..worry about commas and grammar..
You do know that most LNP MPs don’t have their party listed in their Masthead either? G’day Duncan, thanks for posting your comment. You do raise a good point, but when you say “most” you only give two examples, which doesnt seem like “most” to me; that seems like two. But for consistency’s sake I checked out the majority of the Liberal members sites to see what they feature on their sites. As you rightly point out, Christopher Pyne, who has a pretty fancy site, doesn’t really proclaim what party he stands for. I will admit that this is a little strange, but Labor supporters would probably say that is reflective of Mr Pyne. 🙂 So I will concede that one. Scott Morrison, on the other hand, features our national coat of arms in his header and he clearly mentions he is the Shadow Minister for Immigration. Also there is really no colour scheme to his site with it being mostly white. However, the Liberal logo is rather prominent 3/4’s down the page, right in the middle of the page. So I will argue the toss with you on that one. All the other personal sites that I checked either have prominent logos or explicit references to the Liberals, or being Shadow Ministers on their sites. Nearly all of which are clearly visible, often without the need to scroll. I guess the main point that I was trying to make is that there really aren’t any noticeable examples of (former) senior members of the Opposition that have blatantly discarded the primary brand colours that are normally associated with their party for colours, such as orange, which are not normally associated whatsoever with any political party in Australia. When you see orange, what Australian political party do you think of? I don’t recall it being used by *any* political party in Australia ever before, but if you can provide an example I am more than happy to take it on board. It seems just a little strange to me that some of these members, who are mostly in marginal seats, don’t mention that they are Labor members and shun the atypical colours of the Labor party. Red (and blue to a lesser extent) is Labor’s colour, not orange or green for that matter. Some would argue that green is something that could readily be associated with Labor since Julia Gillard has come to power. Whether that is a good thing or not, I will leave that judgement up to you. Once again, thanks for your thought provoking contribution.